The East Manhattan low-sulfidation-type project consists of 84 Federal lode claims for a total of approximately 680 hectares and is located at the eastern edge of the Manhattan Mining district, approximately 19km southeast of the giant low-sulfidation Round Mountain Gold mine complex. Bravada’s US subsidiary conducted two drilling campaigns at the project, primarily along two of several mapped zones of auriferous veins. Shallow gold mineralization has been intersected along the primary vein zone for 425 meters of strike length. The Company’s best drill hole, EM08-010, intersected an estimated true thickness of 11.25m of 2.868g/t Au at 91.4m depth followed by 11.25m of 0.805g/t Au at 118.9m depth. The vein zone projects along strike for another approximately 870m to the east under thin gravel cover, which will be the primary target for a drill program anticipated for early summer, after additional geophysical surveys are conducted. 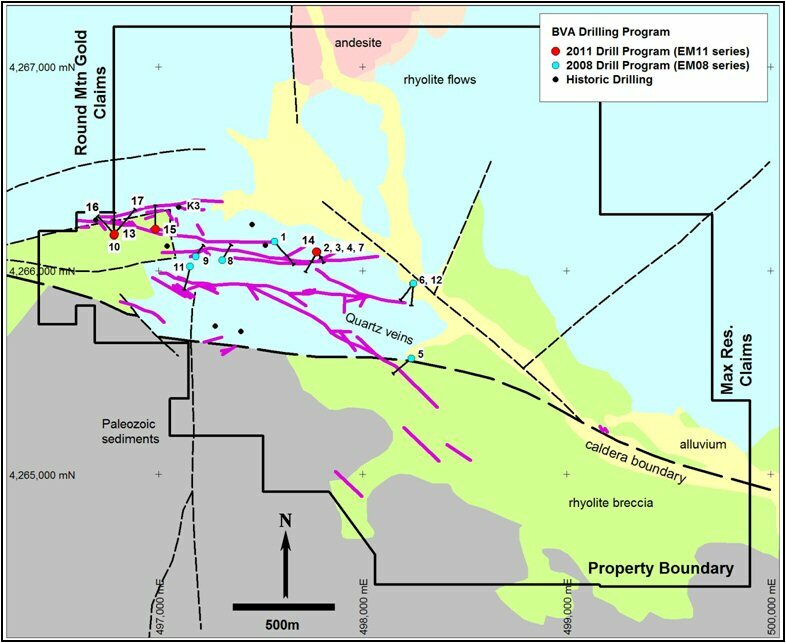 The 2011 drill program successfully extended shallow portions of the main mineralized zone to 425 metres of strike length. Three of the holes offset the company's best 2008 hole, EM08-010, which intersected a previously reported estimated true thickness of 11.25 m of 2.868g/t Au at 91.4m depth followed by 11.25m of 0.805g/t Au at 118.9m depth. As shown in the following figure and table, hole EM11-015C tested approximately 200m to the east of EM08-010, while EM11-015C tested the down-dip extension of mineralization in a second vein zone, which also contained several encouraging intercepts in the 2008 drilling program. The zone projects another approximately 870m to the east under thin gravel cover and will be tested in potential future drill programs. Metallic screen assays for holes EM11-016 and EM11-017 determined that coarse gold was significantly under-reported in some intervals, with the largest discrepancy doubling the grade of a 2.5m wide vein zone from 0.647g/t Au (original fire assay) to 1.327g/t Au (metallic screen assay). Metallic screen assays are planned for other significant intervals. A table comparing the original to metallic screen assays is available here. The grades of mineralization encountered during this core program are similar to those intersected during the 2008 reverse-circulation drilling program, indicating that less-expensive R.C. drilling is adequate to further test shallow portions of the property in potential subsequent drill programs. A detailed ground magnetics survey was completed which suggests additional targets, which have been permitted subject to posting of a bond. The Company is seeking a partner to drill test the targets. The first-phase program consisted of 2,091 metres in 12 reverse-circulation drill holes (see figure below) that tested five of the multiple vein zones on property. Preliminary gold assays are shown in the table below. Hole-EM08010 is particularly encouraging as it contains two significant intervals: 11.25m of 2.868 g/t Au at 91.4m depth followed by another 11.25m of 0.805 g/t Au at 118.9m depth. In addition, hole-EM08007 contains several zones of gold mineralization, with the best being 1.19m of 2.43 g/t Au at 77.7m depth. Gold assays for the first four holes are also encouraging, particularly holes EM08002 and EM08003, which were drilled from a shared site. EM08002 contains 7.2m of 1.41 g/t Au, including 1.2m of 6.31 g/t Au (gravimetric rerun is 2.84 g/t Au), at 50.3m depth and EM08003 contains 5.1m of 2.08 g/t Au, including 1.7m of 3.85 g/t Au (gravimetric rerun is 3.31 g/t Au), at 77.7m depth. Hole-EM08003 cut the mineralized zone approximately 43m down dip from EM0802. Results indicate that the central vein zone, with veins dipping north in holes EM08002, 003 and 007, and dipping south in EM08010, may delineate the primary conduit for gold-bearing fluids. Click here for East Manhattan Project - 2008 Drilling Program - Phase I Intervals +0.5 g/t Au.